Ein Abend in WORM is the premier event-series for headstrong underground pop culture made in Germany, taking place in Rotterdam. In previous years the series hosted artists such as Palais Schaumburg, Wolf Müller (Jan Schulte), Der Plan, Chris Imler, Die Goldenen Zitronen, Bodenständig 2000, Transport, Asmus Tietchens, Don’t DJ and many others. This year’s line up guarantees an exhaustive, amazing trip into left field electronic music, wave, synthpop and dub-laden Kraut meanderings. Ein Abend in WORM is de onvolprezen event reeks voor eigenwijze popmuziek cultuur van Duitse bodem, in Rotterdam. Kopstukken als Palais Schaumburg, Wolf Müller (Jan Schulte), Der Plan, Chris Imler, Die Goldenen Zitronen, Bodenständig 2000, Transport, Asmus Tietchens, Don’t DJ en anderen vonden hun weg naar Ein Abend. De line up van deze editie staat garant voor een geweldige trip door left field electronica, wave, synthpop en dub-achtige Kraut grooves. Detlef Weinrich aka Tolouse Low Trax clearly isn’t a newcomer to the scene. The prolific German producer is the man behind Dusseldorf’s famous Salon des Amateurs club, and an member of Kreidler. Detlef’s music is linked to something rudimentary, but he doesn’t want it to be obligatory minimal. His self-imposed limitations offer lots of liberties. This ethic is exemplified in Tolouse Low Trax releases on labels such as Idle Press, Infiné, Karaoke Kalk, Kunstkopf, Neubau, Themes For Great Cities, Antitote or Cómeme. He explores Afro-Baroque elegance through obscure arpeggios, turning genres into blurry scenarios in which you can lose yourself… and when you want to go back, it’ll be too late. Neuzeitliche Bodenbeläge is Joshua Gottmanns and Niklas Wandt (see also Transport, Wolf Müller, etc.). This year they released their debut which references a broad range of styles; from German wave and Synthpop to Kraut grooves, on the Düsseldorfer label Themes For Great Cities. This 7″ entitled “Ich verliebe mich nie/Pfleg’ mich” conjures up Berlin neighbourhoods with streets full of discarded household goods containing ephemeral, profane stories of loners living troubled lives, but tales of crises put on wax never sounded this sweet. 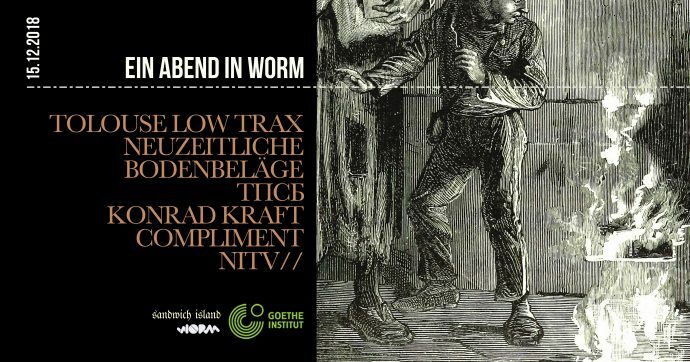 Their live set at ‘Ein Abend in WORM’ promises te be a drum-heavy, playful and dub-laden pop affair. тпсб (tpsb) is an abbreviation of “темное прошлое светлое будущее”, which translates to “dark past bright future”. His debut album “Sekundenschlaf” has been released on the London-based label Blackest Ever Black in early 2018. “Sekundenschlaf” references contemporary European electronic music as well as (early) jungle and ambient techno. Its response to tradition and zeitgeist is idiosyncratic – with a specific atmospheric theme rooted in the majesty of Western Russian nature, and the anxiety and distress of the country’s post-Soviet working class. Konrad Kraft aka Detlef Funder is one of the essential producers of Düsseldorf’s fertile electronic music scene. He began experimenting with semi-modular synths in the late 1970s. Influenced by Punk, Industrial and the Berlin school, he released his first cassette tapes at the beginning of the 1980s. Throughout the late eighties and during the 1990s he became co-founder of the Düsseldorfer label SDV-tonträger (Paul Schütze, etc. ), started working as a Techno and Trance producer under different pseudonyms, and became a member of the 4-cn recording studio, where he focused mainly on mastering, from the end of 1999 to 2007. Currently, the often overlooked original works of Konrad Kraft are being re-discovered, enjoying renewed appreciation. Be sure to catch his live set early this night! Dresden expat Compliment is one-third of Club Gulfstream, informal tech-crew member of The Beatmakers Union, and one-half of Les Cidres. In his DJ mixes he knows how to add a touch of tongue-in-cheek weirdness. With his amazing selection of house, disco and outernational music he will complete tonight’s line up. NITV// is The Hague based artist NR Urban. She studied at ArtEZ Aki in Enschede, SMFA in Boston and at KABK/Royal Conservatory of The Hague. Her visuals include animated drawings and a variety of other media, abstract fields of rhythm, texture and colour, and video-mapping.